When my children were younger, this time of year was filled with dread of the inevitable question from well-meaning adults everywhere: “What do you want Santa to bring you?”. A pretty universal holiday question, but a bit of a stumbling block for my kids. Santa never brought them anything. They didn’t believe in Santa. Is Santa banned from my house? Not at all. We can (usually) name the reindeer, we appreciate a jolly man in a red suit, and we proudly display our so-hideous-it’s-glorious dancing Santa figure who shakes his hips to the tune of “Rockin’ Around the Christmas Tree”. We have Santa in our house. I just never taught my children that Santa Claus is a real person. Just like I didn’t teach them that Elmo or Mickey Mouse are real. Santa’s a real story. He’s just not real. Children don’t inherently believe in Santa. They’re taught to believe, just like they’re taught the names of colors, how to cross the street, and how to share with their friends. Children are born with instincts, not knowledge. Parenting is adding that knowledge. It’s years of the little daily monotonies and the giant life-changing crossroads. It’s the useful little thing I teach them about how to play a new game as a child. It’s the essential lesson I teach them about how to function as an adult. Living is about daily adding to our experiences as a human being. Even the painful things add something to how we understand the world around us. The millions of tiny, raw and real moments together add up to a life. There really is no taking away. There’s only adding. So, we didn’t take Santa away from our children, we just never added him into their lives. What we did add was the lives of the Saints, including the real person named St. Nicholas. Saints’ lives are incredible stories. The “so good they can’t be made up” kind of amazing stories. Saints are real people with real experiences, successes, and failures. The more we meet them through their biographies, the services written for them, and most importantly, through asking for their prayers, they cease being a story and become a living person. We realize they are friends and family unlike any we have in this world. They only want good for us, and their singular motive is love. They have allowed God to work through them unhindered, and they are still very much alive in Christ and waiting to have a relationship with us. Sure, I introduce all kinds of fictional stories to my children. I’m a homeschooler. It’s literally my job to read fiction to my children! I read them nursery rhymes, and picture books, and novels. I encourage them to play and imagine and dream. I leave room in their schedules for unstructured imagination. All of these things are good, but there is something even better. I also read to them the Scriptures and the lives of the Saints. I encourage them to have conversations with the Saints and get to know them personally. I leave room in their schedules for God to step in and work in the lives of my children more than I could ever imagine. The Saints add so much value to our lives. We share joy and sorrow together. We worship God together. We live in Christ together. The impact they can have on our spiritual and physical life is so massive, addition no longer covers it. Because that’s how love is. It isn’t added. It’s multiplied. When I truly look at the depth of love that knowing a Saint like St. Nicholas adds to my children’s lives, my only response can be to do everything I can to clear their path to knowing him. The holiday season starts as a blank slate. We choose what we want to add to it. Even when we think we don’t have a choice, we do. If we don’t step up and control our lives, the world will do it for us, and the result is never pretty. We decide what and who we invite into our celebration. At Christmas time in my family, we hear stories about Santa Claus, but we meet a person named St. Nicholas. If I taught my kids that Santa was real, I would someday have to take that belief away from them. I would rather spend those few, precious years of childhood teaching them about the things they can believe for the rest of their lives and beyond. Instead of creating an illusion of a false person, I would rather add the truth of relationships with real human beings to their lives, who they can meet and know and love forever. So, on December 6th, we join with so many around the world and remember the great man of God named St. Nicholas. We put coins in the shoes of the young ones to remember St. Nicholas’s love and compassion for everyone in need around him. We take our kids to church and ask for St. Nicholas’s prayers, not his presents. We teach our children to believe in a man worth believing in. Holy Father Nicholas, pray for my family today and always. Do not give us presents of earthly things that will fade away. Give us rather the gift of a heart that is open to seeing and receiving Christ. In the manger, on the Cross, and in the Eucharist. Today, on Nativity, and for eternity. Help us to make the most of the remaining days of this Fast. To prepare for the gift of the light in the darkness, so our joyful hearts may be ready to proclaim in one voice with you and all the Saints: Christ is Born! Glorify Him! The Holy Week Lapbook is back by popular demand! This item was first available here at the blog in 2013, but I have not had it for sale for some time. Many of you have been requesting it, but I did not think I would be able to revise it and have it ready in time. I’m glad I was able to do it! The Holy Week Lapbook is available as a Digital Download or Printed Kit. Also, the price of the Holy Week Learning Box has been reduced. Come to the shop to see what’s currently available! The April 2016 Learning Box contains lessons and crafts on: Presanctified Liturgy, the Akathist to the Theotokos, and the Prayer of St. Ephrem. The Holy Week Learning Box is a BIG product containing lessons and crafts for all nine days from Lazarus Saturday to Pascha. Come visit the shop and see what’s new! Can you ever really go back again? Hilary had a class on the other side of town today. And by town, I mean metropolitan area, so about forty minutes from home. We used to live in that area, though, so we decided to visit one of my favorite parks in our old stomping grounds. The sky and the sun screamed spring, but the biting, cold wind roared otherwise. I remember this playground so very well from the summer of 2007. The kids were 11, 10 and 2. Lonna and Jared had swim team practice at the pool next to the playground on Monday through Friday for two and a half hours every evening. Just turned two year old Hilary and I spent hour upon hour waiting in the giant sandbox for the big kids. I have so many memories from that summer. Probably because that was at the tail end of the “bad year”, as I refer to it. I had five heart surgeries in twelve months, I think, including open heart valve repair. Maybe it was six? I get them all mixed up. I was so stinking glad to be out of the house and sitting at that playground. The sun shone differently. The colors had more substance and more depth. I didn’t have to fight for some awareness that I myself was different after having my body so thoroughly and utterly broken. It was just so obvious. This playground is such a great one, because it has so much for so many age groups. Just as much stuff for the little guys as the big kids. After a few weeks, Hilary tired of the baby area. I would catch her eyes wandering over to the big kid slide, the one with all the twists and turns so many feet up off the ground. There was no easy way to get to the top. To go down that slide, you had to earn it. Hilary just couldn’t resist the challenge. The monotony of the days of endless swim practice was made better by watching her figure it all out ever so slowly. At first, she just walked around the perimeter on the ground, throwing back her head and peering through the grates at the kids climbing up. Then, she learned how to maneuver the first small group of steps. After that, came the next ones. And the next. Somewhere around the end of July, she was at the top of the slide. I stood at the bottom wondering if I had made a terrible, terrible mistake allowing this to reach this inevitable conclusion. But there she was, flying around the final turn with her baby fine hair all full of static and a gigantic grin on her face. I lifted her to the ground, and her diapered bottom swished quickly back to the steps to start again. That time, and the hundreds after it, the whole process was a piece of cake. We got all kinds of stares that summer. The baby on the big slide. The mother who must not be paying enough attention. But they were only seeing the end result. They didn’t know the process. They didn’t know we were there every.single.day for hours practicing. I didn’t just park her at the top of the jungle gym, walk away, and tell her to find her own way down. She got to the top of that slide in gentle stages. Learning just a bit more each day. She earned it. Watching Hilary again on that playground, nine years later, was all warm, fuzzy, and mildly unnerving, like any good moment of nostalgia. This was the same place, but we were such very different people. Hilary loomed over the tiny toys, and the big slide was just another blip and hardly a big event. So I asked myself, can you ever really go back again? In Christ and the Church, you most definitely can. Every year, at this time, Lent comes. The place is the same. The rhythm and the structure are familiar and constant. The only thing that has changed is us. Lent happens every year for a reason. It’s a gentle lesson. A yearly polishing. At first we take it slow, pushing ourselves just a little bit. When we find that we can do that, we ask a bit more of ourselves. And a bit more. And a bit more. It doesn’t all happen in one day or one Lent. It’s a lifetime of yearly trips to the park, where the big kid slide seems so tall and so completely impossible until a little bit of prayer, a little bit of fasting, a little bit of practice gets us up the first small set of steps, and then another, and another, until we’re further along than we ever thought we could be. And the Church doesn’t abandon us up there on the edge. No, she guides us and shows us and encourages us to be thoroughly and utterly broken, so Christ, in His mercy, can put us back together. If we live Lent well, we’ll change. It won’t be a battle to see how much we’re different. It’ll just be so very obvious. I’m thankful today for the memories. I’m thankful for this gift of Lent that has come again, right on time as always. I don’t know exactly where I’ll be at the end of this season, but I pray I’ll do the work. That I’ll earn it. God willing, it’s going to be a beautiful climb. And so it begins. Waking up today, everything feels and looks a little different. The world isn’t the same as it was yesterday. The Fast has begun, and all of life has caught its breath in anticipation. Now, this could feel like any other Monday if I let it. It’s only different, because I am choosing to embrace the fact. Lent is not a burden imposed on us. It is a gift we can accept or refuse. These lofty concepts are not the easiest to grasp for children. It definitely can just seem like the time of “have to” and “cannot”. On this, the first day of Lent, here is a short, free lesson and craft to help your children see a little more clearly the path ahead. Then, print out the attached picture. You can use colored paper or cardstock if you have it, but plain, white copy paper is perfectly fine. Following is an example of how to decorate your wallhanging, but there is no right or wrong! Let your kids do whatever they want! When we did this at our house, Hilary used three colors of acrylic craft paint and a Q-tip for her decoration. It would also be really cute if your children used their fingertips to paint with. If you don’t have paint, markers and crayons would work great! We hung ours underneath our Magnetic Lenten Calendar, which this year is residing on a white board in our school area. The countdown begins! Another thing to remind our children (and ourselves!) during this time, is that one of the great blessings of Lent is community. Everyone in the Church is on the same schedule right now, and we’re there for each other. When we’re unsure what to do, turn to the Church. When it gets hard, turn to the Church. When help and encouragement is needed, turn to the Church. We’re going to celebrate on Pascha together. Let’s help each other get to the party! The first day of cleaning out the gunk and build up in our lives is a reason for its own mini-celebration. The gifts and blessings are on their way. May you and your family have a blessed, blessed Lent! Lent begins in less than a week. I am immersed in an annual, familiar mix of thoughts and emotions. I am exceptionally aware right now of my role as wife and mother. What will I feed these people? What guidelines will I put in place for entertainment and activities and church attendance for the next two months? When it’s 5:30 p.m., and the day has imploded around us, with everyone and everything pulling and needing and surrounding me with those questions and frustrations and wounds that only Mom can address, what will be my response? Chop that pile of vegetables, or call for pizza? When I’m exhausted and scattered and pushed to the edge of my limits, will I decide that we should all just skip Presanctified and dissolve into the numbing abyss of Netflix? Mothers are more than keepers of the home. Mothers are keepers of the fast. The household machine runs on whatever expectations have been set until Mom changes them, and if I so choose, I can lead them down all manner of paths. The weight of that knowledge makes me pause, as it should. Through my behavior, I can build up my family’s fast, or I can tear it to pieces. This is an awesome responsibility. And it doesn’t have a thing to do with food…you know that, don’t you? It’s about the Lenten spirit, or lack there of. Who cares if I chop those vegetables, if I do it with a foul attitude. Food cooked with prayer tastes sweeter, and food cooked with bitterness burns with the same flavor. If Mama ain’t happy, ain’t nobody happy, and if Mama isn’t traveling down the Lenten path, how quickly the rest of the family wanders. We mothers know the power we have to set the tone in our homes. We fully use it to our advantage when it comes to baby’s schedule, the little one’s play choices, and the teenager’s ever-expanding limits. We have the power. Will we use it for good this season? So, I ask myself the question: “What will my Lenten home look like?”. Will it be peaceful like the church at the evening services, when the candles glow? Will it be soft like the embrace of prayer, when there is no beginning and no end? Or will it be the place where rules abound and grace fades? A place where the hard things are made more difficult by a short word, a wrinkled brow, and a desperate lack of joy? It’s not hard to know what I want our Lenten home to be, the struggle comes in the process to make that happen. So, I embrace this time of preparation. For weeks, the Church has been gently reminding me and prodding me to prepare. Lent is coming. Are you ready? Am I ready to be the mother who supports and encourages the fast of my children? Am I ready to be the wife who builds up and strengthens the fast of my husband? This is about their Lent. This is about MY Lent. I don’t need to concoct some grand scheme of exercises to grow spiritually between now and Pascha. God has given me the great gift of a Lenten school right here under my own roof. There’s no need to look anywhere else. I pray that I will truly see it as a gift. That I will open myself to the lessons that are sure to come my way over the next few weeks. What a blessing to have these people and this place which God can use to speak to me. May we keep our fast well, Lord. With Your help, may we keep it quite well. The Crafty Contemplative is open for business! In an effort to provide everyone with the best possible shopping experience, I’ve decided not to run sales through this blog, as I originally planned. Instead, I’ve set up a separate website. Come by for a visit! Sales are also available directly from our Facebook page! Please like The Crafty Contemplative and keep up with all the latest news. I am pleased to say that I will begin selling educational craft items through this site next week. 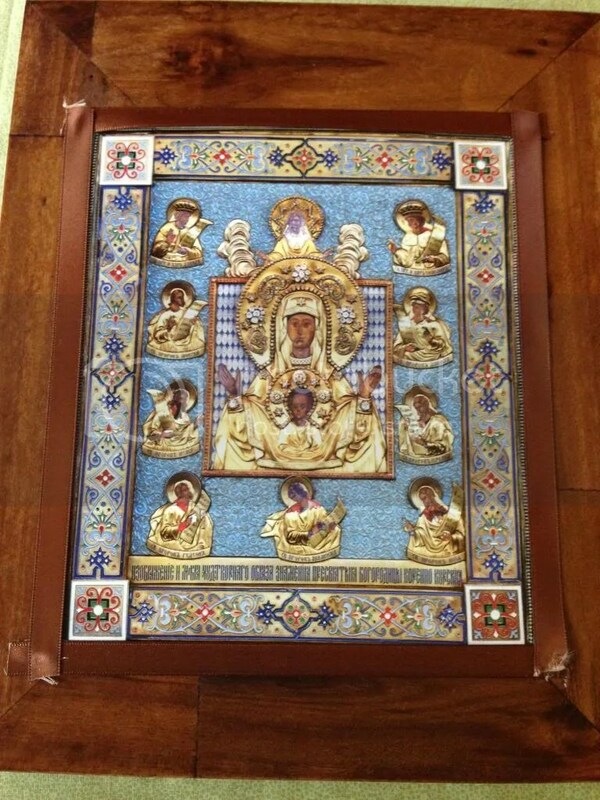 If you were familiar with Orthodox Christian Craft Supply, my former website, you’ll see some familiar items, but everything has been refreshed and updated. The sales format will also be different, but the goal is the same. Our Catholic and Protestant friends have many teaching resources. However, the options that are purely Orthodox are limited. learning resources for Orthodox Christian families and parishes. Each month, you will receive a box of supplies that is themed to the liturgical events of that specific time. Included, will be a color study guide with commentary and activities on two or more Feasts or Saints commemorated in that specific month. Also inside will be complete materials for a minimum of three crafts complete with full-color instructions and tutorials. Subscriptions will be available in 3, 6, and 12 month increments. Boxes can also be purchased one at a time. At this time, family boxes will be available. Beginning in late summer of 2016, Church School boxes will go on sale containing monthly lessons and matching crafts for parish, school, and group use. A limited number of individual craft items will be available, including items for fasting seasons. In the next few months, electronic resources will become available including ebooks and lapbooks. On Monday, March 7th, sales will begin right here at http://www.craftycontemplative.com under the “Shop” tab at the top of the page. On your mobile device, the “Shop” page is listed under the drop down Menu. Magnetic Lenten Calendar: A tool to count down from Clean Monday to Pascha with your children. Includes a color study guide with daily Scripture readings. The Crafty Contemplative Learning Box for March 2016: Includes supplies to make crafts to commemorate the Sundays of Lent and Annunciation. Also includes a color study guide. You will be able to purchase just that box, or you can sign up for a 3, 6 or 12 month subscription. I’m so excited! Please check back on Monday and see what’s new! It’s been two years since I last wrote on this blog and almost four years since I closed Orthodox Christian Craft Supply. Neither of those numbers seem anywhere close to correct. Where would I even begin to list the things that have changed since then? It’s interesting how picking out one moment in life helps you see all the rest of the pieces in a different colored light. Life goes on. I’m hardly the first to notice that. With God’s help, I’m pleased to say that I’m back. I’ll be writing again on this blog, and I’ll be selling educational and craft items. I loved Orthodox Christian Craft Supply so much. It’s never left my mind and heart. But I’m a big enough girl to admit that I never ran that business correctly. So many times, I get too big and too complicated with my ideas. The shop was no different. I let that business take over and run my entire life. It was an explosive mess that ended with me falling flat on my face…hard. I messed up. I fell. That part is obvious. Whether I stay down there or not is purely my choice. After a season of regrouping and contemplation, my choice is to get up and start the climb again. 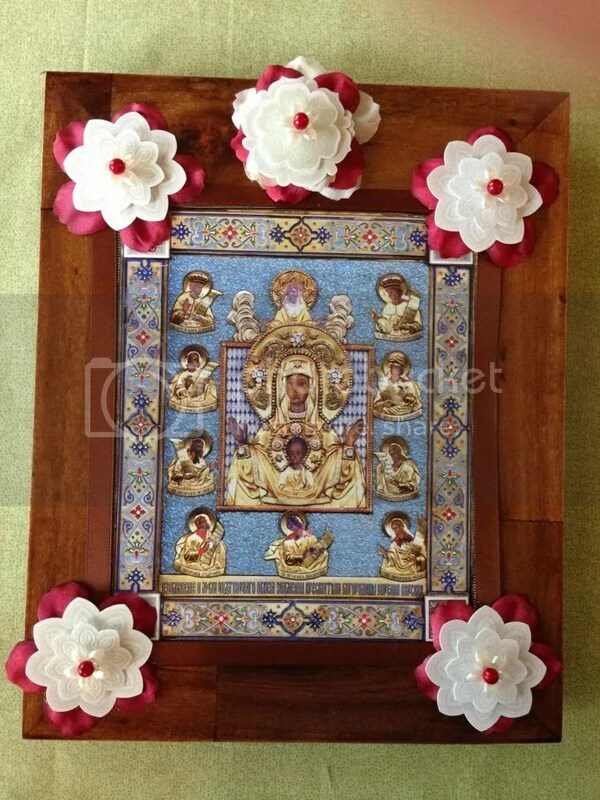 My next post will describe how I plan to revamp Orthodox Christian Craft Supply into something that is the best possible thing for both you and me. Forgive me if you wrote in the last few years and received no reply. I did not check the email associated with this blog when I stopped selling items. Rather than going backward, I’m just wiping everything out and starting fresh. If you wish to contact me now, know that I will be sure to look for your message. Please pray for me as I begin again. Looking forward to having you along on the journey with me! Today is the Feast of Annunciation. I always try to do some type of flower related craft with Hilary on this day. Who doesn’t enjoy giving flowers to their mother? It just always seems like the perfect way to show love to the Mother of God on her Feast Day. I decided that this year we would decorate the paper copies of the Kursk-Root Icon that we received when we visited it a few weeks ago. The icon is not a standard size, so I didn’t have a frame that I could use as is. I wanted to use what I already had, so I chose a wooden frame I love. 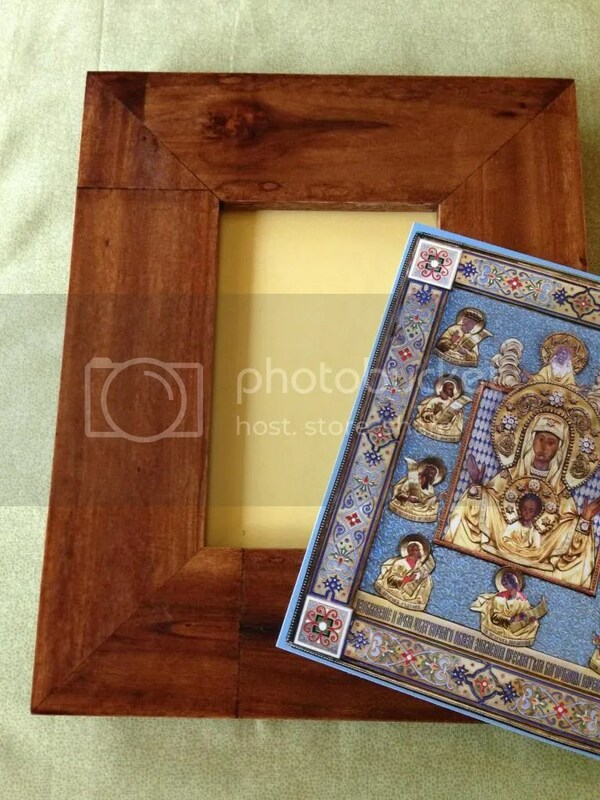 I didn’t want to do anything permanent, so I lightly tacked the icon onto the frame with hot glue, covering the hole. Since it’s wood, the glue will just pop right off when I want to do something different with the icon. 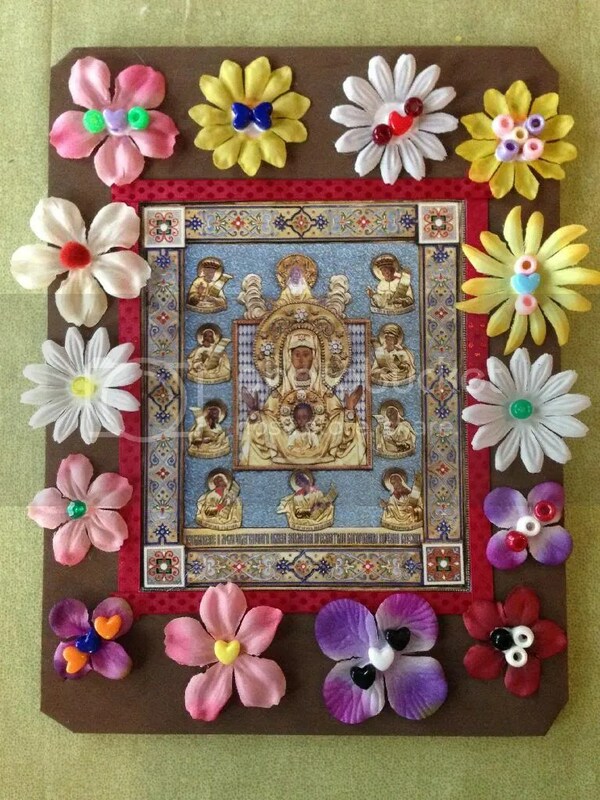 I glued ribbon around the edges of the icon, creating the illusion that it was sitting in the frame. 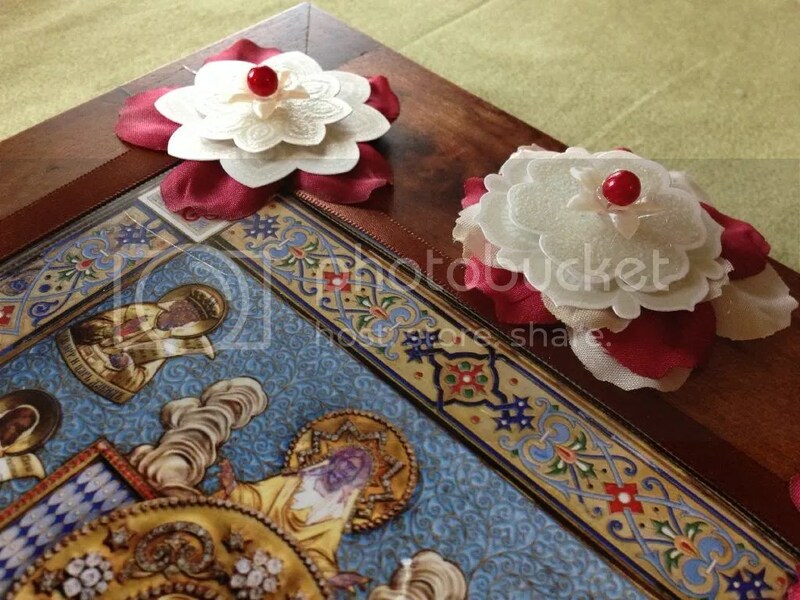 Then, I added some silk and paper flowers, as well as some beads to finish it off. For Hilary’s project, I attached the icon to the center of a piece of thick craft foam in the same temporary way that I did mine. Then, I turned her loose with flowers and beads. On this day, we remember a girl named Mary, who when faced with the unbelievable news that she would have a son, set a pure example for us of what it means to follow Christ. It’s not about understanding what God asks us to do. It’s not about agreeing with it, wanting to do it, or even seeing how we’re physically capable of accomplishing it. It’s just listening to God. Listening and doing what He asks. God asks us things every day. Sometimes they’re big and dramatic. Sometimes they’re small and seemingly menial. But they’re all there for a reason, if we’ll see it. Each day and each time that we say “yes” to God, we see Him just a little more clearly. As the snow softly falls on this Feast Day, I pray that the Mother of God, full of grace, will continue to show me how to listen and how to say “yes”. Every day. Every moment.